The holidays are over and it is time to get back to the business of work and home. For many of us, this is the time of year when we take a look at our surroundings and try to figure out a way to organize things and, more importantly, to keep things organized for the whole year. After all, did you know that 65% of all resolutions are broken within six months?! Here are a lucky 13 ideas that might help you meet and keep your organization resolution. The biggest key to organization is to regularly throw out what you don’t need. Martin and I have a rule that every time we purchase a new piece of clothing we have to discard or donate a like item. For example, one new t-shirt results in an old shirt being donated or re-purposed into cleaning and polishing rags for the business. In order to avoid the hassle of trying to store those cumbersome Christmas tree stands we choose to recycle the stand each year. Not only does it save us about $6 it also saves some space in the garage. Big box stores like Target and Walmart and specialty stores like The Container Store offer a myriad of drawer and shelf organizers at affordable prices. Wire shelves can double your shelf space as will compartment drawer organizers. Imagine how nice it would be to open a drawer and locate exactly what you were looking for on the first try. Find unused space. There is often plenty of space above your closet rods, in the laundry room or hanging above the cars in the garage. And don’t forget the back of the closet or bathroom door. And even better, custom storage units for those spaces. Rarely used items should be stored elsewhere moved to make room for everyday pieces in the kitchen and bathroom. That turkey roaster takes up a lot of valuable space and would be just as comfortable stored in the garage. Underbed storage is valuable real estate. Store extra blankets and pillows, out of season clothing, toys and games and even those long rolls of Christmas wrap out of sight yet still accessible. Install slide-in shelving under the sink. This will make it possible to see what you have and avoid duplicate buying of those items that disappear in the cavernous back area of these cabinets. Paper hoarding is a problem many of us have. Invest in a shredder and use it! When you check the mail either file it, toss it or shred it. It only takes a second to fold socks together when they come out of the washer. Imagine the time saved by pulling out a pair of socks vs. having to rummage through the drawer to find the mate. Simple, yes? Think outside the box. An ottoman with a removable top is a great place to store purses, casual shoes like flip-flops or even seasonal decorations. Label boxes and shelves, especially those in the garage. This will make it so much easier to find holiday decos, camping equipment, ski clothing etc. Think ahead. When the time comes to take down the Christmas lights, take the time to wrap them around an old piece of cardboard. You will be glad you did come tree decorating time next year. If possible, go behind the walls. There is hidden storage between the studs of your walls that will not take up valuable floor space. Find a good contractor or do it yourself and discover space for toiletries, towels, make-up and even display collectibles. 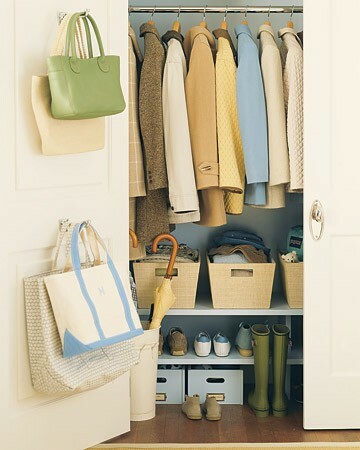 There you have it…..our 13 top storage and organization tips for 2013. What is your favorite tip? This entry was posted in Uncategorized and tagged organization, organization tips, recycling, storage, storage tips. Bookmark the permalink.